Your trucks work just as hard as you do. That’s why it’s important to schedule regular service and maintenance visits somewhere you trust. Your trucks are world-class vehicles, so it is imperative to provide the finest care for them. At Papé, our service and maintenance teams are dedicated to providing premium care for your trucks. 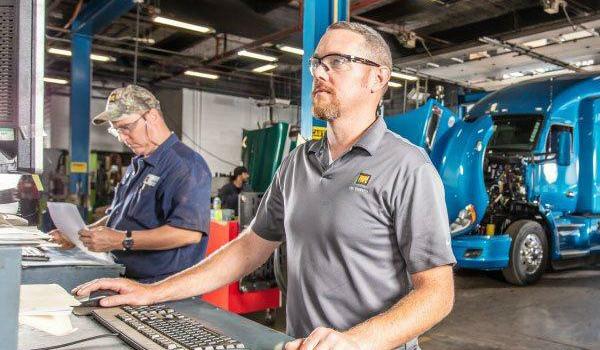 It is our bottom-line commitment to you that we will keep your trucks running at peak performance levels. You can even reach the Kenworth PremierCare Roadside Assistance Call Center after hours by calling 1-800-592-7747, just another reason you can trust Papé to keep you moving 24/7. When your truck needs service, trust Papé to provide exceptional customer service and high-quality parts from certified service professionals. At Papé Kenworth, we are proud to offer you end-to-end solutions designed to keep you moving from start to finish. That’s why we offer everything from roadside truck repair to semi-truck repairs on all makes and models at our service centers, just another reason you can trust Papé to keep you moving. With our up-to-date maintenance and repair procedures, we can get to the root issue faster and get it fixed right, the first time. That’s why every bit of service you have done with us is covered by a 90 day or 25,000-mile warranty on labor on top of the parts warranty. We know how important your truck is to your business, so visit your local Papé Kenworth dealership to receive top quality service and get back on the road. Our focus on consistent, quality customer service means that you and your truck will be taken care of by our expert trained team of technicians. With 14 Papé Kenworth locations in Washington, Oregon, and California, we're here to keep you moving. Your address contains an illegal character.